The annual Inver Red & Whites Supporters’ Club prize-giving will take place in Larne Inver Park Social Club after the Championship 1 match against Lisburn Distillery on Saturday 29 April. Prizes will be presented to first team and Olympic players with speeches from the chariman of the Inver Red & Whites and first-team manager, David McAlinden. 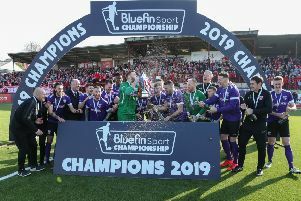 There is also a vote open on Larne Football Club’s website to vote for your Player of the Season. A light supper will be provided and the club would ask as many supporters as possible to come along and show their appreciation to the players and coahing staff for their efforts this season.